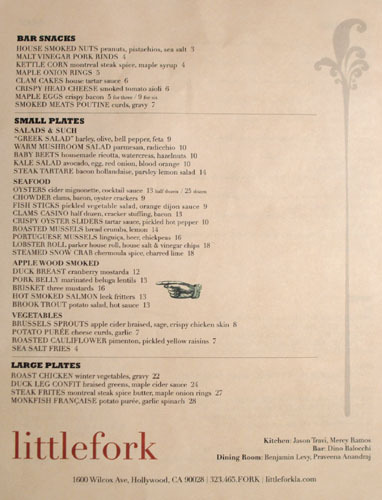 The dearth of solid eateries in Hollywood has long been the bane of many an Angeleno, but the situation just got a little better recently with the launch of Littlefork (a reference to those ubiquitous oyster utensils), the newest project from the long-absent Jason Travi. 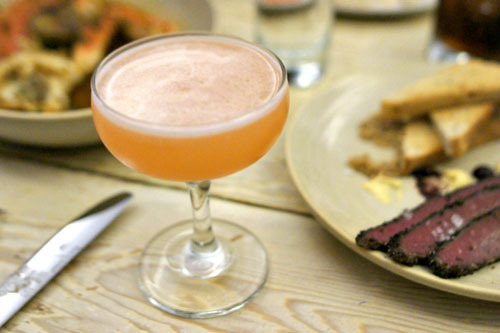 Serving as a sort of homage to the Chef's Massachusetts roots, the restaurant represents a partnership with David Reiss (Sunny Spot, A-Frame, Alibi Room, The Brig) and debuted at the start of January. The conceit here is that Travi pays tribute not only to his birthplace in New England, but also draws inspiration from the southern reaches of Canada near Montreal, an ideology that manifests itself clearly in the prevalence of smoked meats on the menu. A quick recap: When we last mentioned Jason Travi, he was in the midst of a falling out with his partners at Fraiche and Fraiche 2.0 (Riva). It was October 2009, and if you recall, he left the country abruptly with his wife Miho and their newborn in the middle of the Riva-to-Fraiche transition. Upon returning in December, he began looking for a place to open his own solo project, but ended up accepting a position as Corporate Chef for restaurateur Jeffrey Best the following March. He stayed in that role for two years, revamping the menus at Mesa in Orange County and Studio City's Firefly while also collaborating on the opening menu at Downtown sandwich slanger Blue Cow Kitchen. 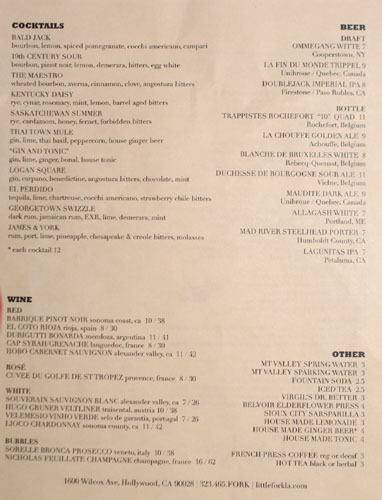 In October 2012, Travi cooked a night at the latest iteration of Test Kitchen at Bestia. Shortly thereafter, he announced plans for his triumphant return at Littlefork, and here we are. The interior has been transformed since its days as Shin Korean BBQ. Penned by designer Sean Knibb (who also did Roy Choi's A-Frame), the space has a sort of Mid-Century-meets-Scandinavia vibe. The dining room is pictured above, but there's also a separate, livelier bar area. 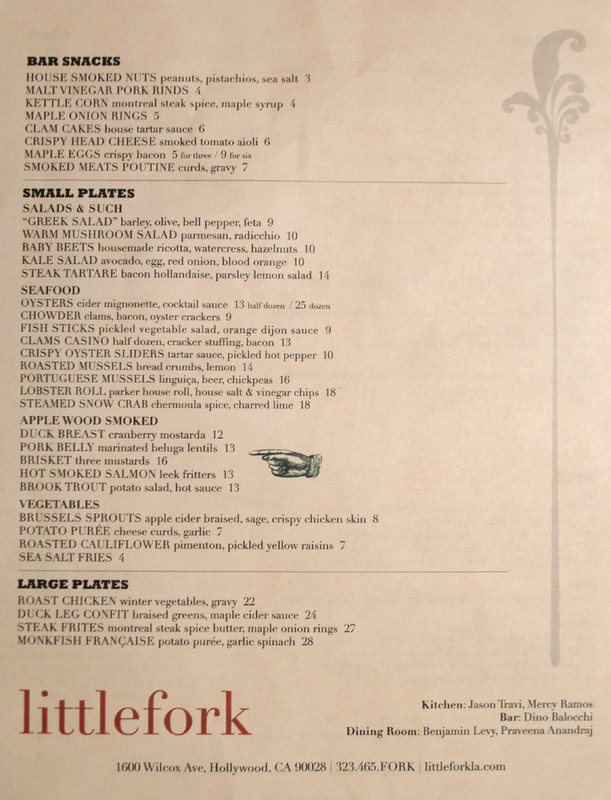 The Littlefork menu combines Travi's interpretations of the best of New England and its surrounding Canadian environs. 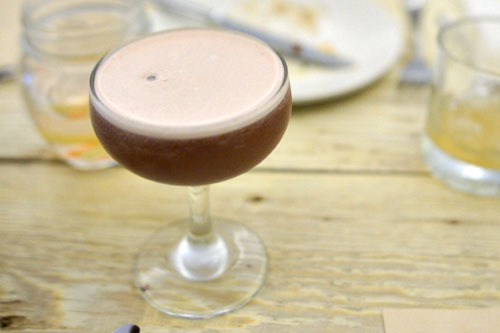 To drink, think whiskey-centric cocktails by barman Dino Balocchi of Chicago's famed Longman & Eagle, as well as a smattering of wine and beer. Click for larger versions. 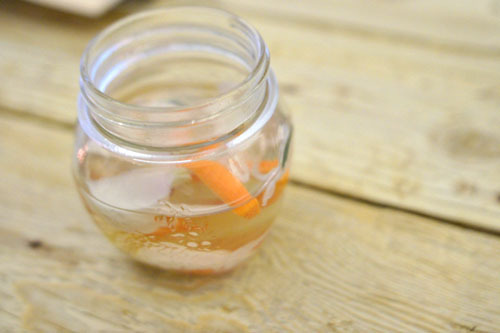 To start: a jar of complementary house-made pickles. A couple cocktails to start. 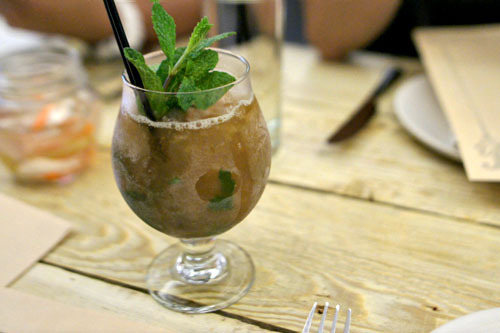 The Georgetown Swizzle was a twist on the classic, an almost quaffable concoction that nicely played sweet-spicy-bitter flavors over the boozy heft of the rum, all while the mint added an overarching lightness to the drink. The Logan Square, meanwhile, paid homage to the location of Balocchi's former digs in Chicago. The balance of gin, Carpano, Bénédictine, and bitters all made sense, though you had to taste hard to find the chocolate and mint; they were there, but very, very subtle. I'm quite the fan of fromage de tête, and have a hard time not ordering it, hence its appearance tonight. 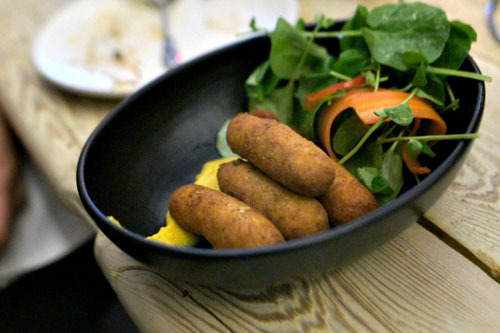 It came in fried fritter form, thus looking quite innocuous to the head cheese virgins in my party. Once you bit in, though, the slick, gelatinous consistency of the meat jelly was there, proudly displayed, though tempered by the savory outer crust. These were tasty little bites, nicely complemented by the tangy aioli and bitter veggies on top. I also had a hard time passing these up on the menu, ostensibly a nod to Alain Passard's iconic oeuf à l'Arpège. 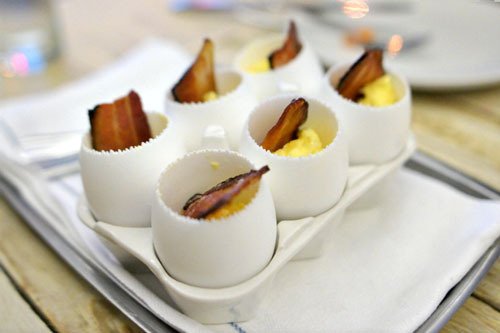 Eggs arrived in light, fluffy form, perked up by the crisp, salty shards of bacon, while the maple cream provided an undercurrent of sweetness that made itself known toward the finish. Breakfast-y. 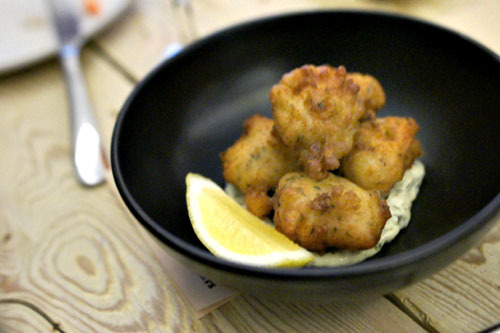 Clam cakes were delightful, really showing off the texture and brine of the seafood against the savory accent of the fried batter. Lovely with a squirt of lemon and dab of the included tartar sauce. 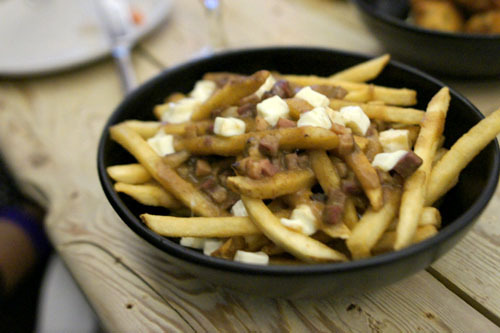 Littlefork's poutine was one of the more traditional versions around. It worked out though, with the gravy adding a hearty, heavy blast of smokiness to the salty fries, while the cheese curds offered up a fitting counterpoint to the dish. Nice texture on the taters, too. Our server tonight just so happened to be none other than the lovely Semhar Tadesse, whom you might remember as the first contestant booted off the island on Survivor: South Pacific. The James & York just so happened to be her favorite cocktail on the menu. It was mine, too. I adored the interplay here between the rum and the sweet 'n' spicy notes of the bitters and molasses, all while the pineapple and lime added a fantastic tartness to the mix. Fat-fingered fish sticks were nice, reminding me of an uppity incarnation of the ones made ever so popular by the Gorton's Fisherman. I liked the levity provided by the pickled veggies here, but the orange Dijon was overly tart, covering up the delicate flavors of the fish somewhat. I would've much preferred a more traditional mustard here. 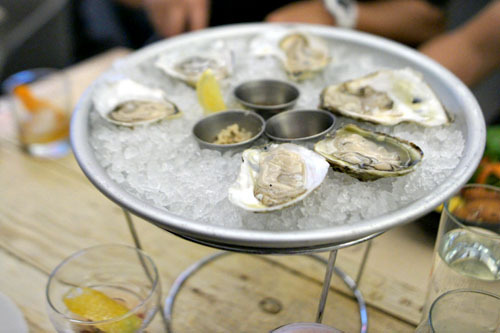 East Coast oysters--Rocky Nook and Naked Cowboy--were spot on: salty, clean and crisp, tasty alone and just as good when slurped with the various accoutrements provided. 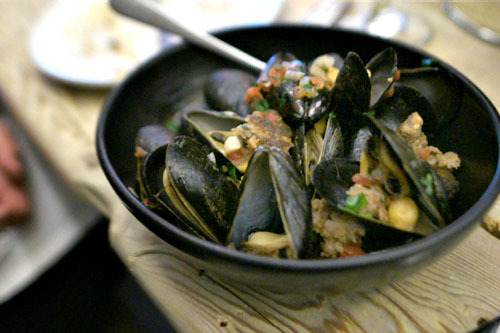 Mussels were also enjoyable, their delicate salinity working hand-in-hand with the savory chunks of linguiça tossed in. 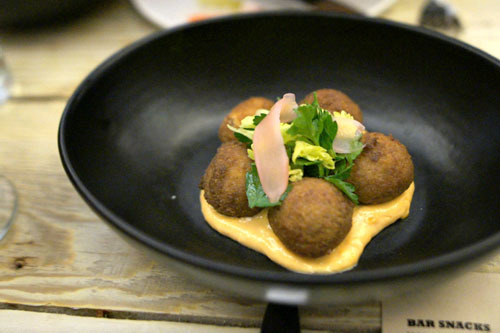 I loved the use of chickpea here, which added a wonderful heft and textural element to the dish. 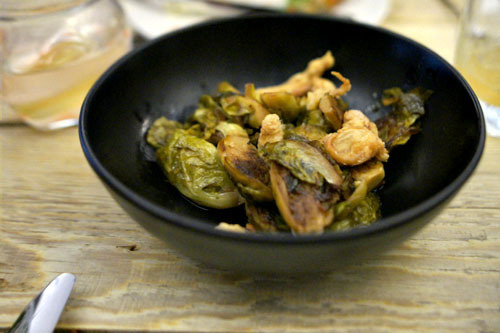 Being the Brussels sprouts fiend that I am, these were a must-order as well. They were delicious, conveying the bitterness inherent in the vegetable along with a delightful sweet 'n' sour character from the cider, all while the chicken skin added a further blast of savory goodness. The last cocktail brought us El Perdido, appropriately featuring tequila. 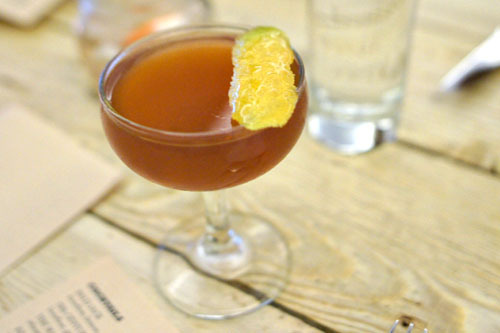 There was an almost candied sweetness to the drink, which was a bit much for me, though the bitter, herb-y nuances here did provide a semblance of balance. 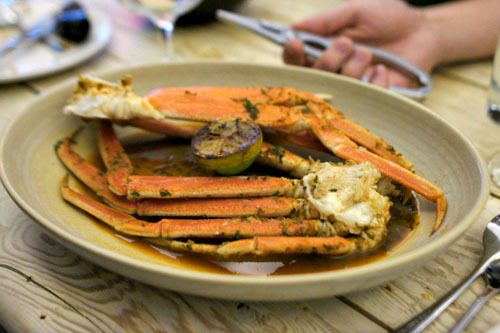 There was far too much work involved with the snow crab, but the results may just have been worth it. The flesh of the crustacean was soft and sweet, tasty alone, but at the same time, not overwhelmed by the herb-y zing of the chermoula. 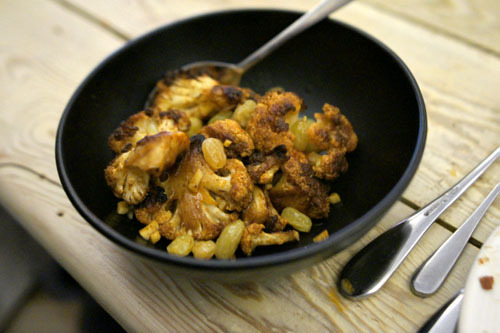 Cauliflower was also a success, still a bit crisp, with a great roast-y character and a hit of sweetness from the raisins. 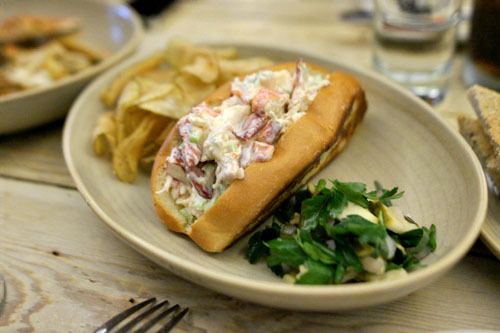 I'm happy to report that Angelenos have yet another choice when it comes to lobster rolls. The version here, done more in the cold Maine salad style as opposed to the hot Connecticut style, went over very well with us. The lobster itself arrived supple and sweet, not overcooked and not masked by the mayo, and worked flawlessly with the sweet, buttery bread, while the greens added a kick of offsetting astringency to the dish. Finally, we ended our run of savories with an item from the "Apple Wood Smoked" section of the menu. 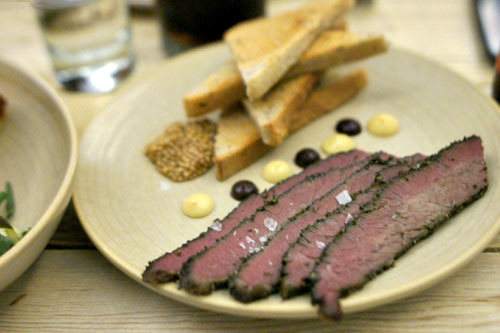 Montreal-style brisket arrived thinly-sliced, with a trio of mustards: whole grain, raisin-infused, and Dijon. The meat was deftly smoked and expertly spiced, as well as fork-tender, though it could've been juicier, more succulent. I enjoyed the brisket alone, but the mustards really did their job here as well in providing a point of contrast to the beef. 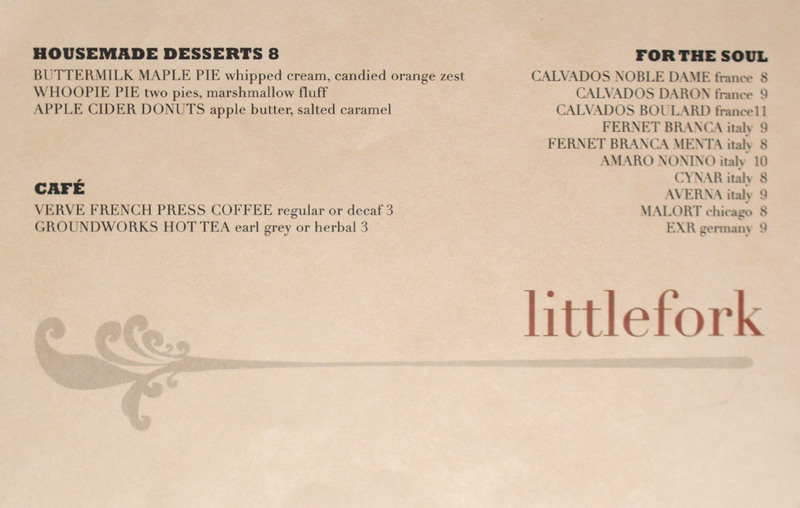 Desserts by Pastry Chef Miho Travi (the husband-and-wife team met at Spago), natch, were a must. Click for a larger version. 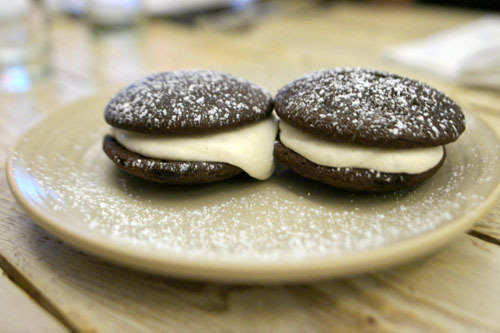 Our first was the whoopie pie, an iconic dessert endemic to the New England area. They were about as good as you'd expect, with the moist chocolate cake combining with the marshmallow frosting in satisfying fashion. 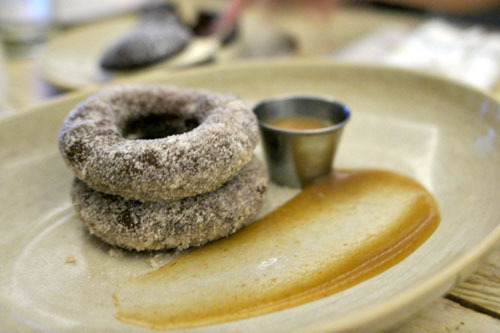 Apple cider donuts, meanwhile, were even better: hot and crisp, with a nice spice to 'em augmented even further by the butter and caramel. I'm happy to report that we have yet another legit place to grub in Hollywood. It's nice to have the Chef back cooking, and this experiment of melding an East Coast seafood joint with a Montreal-esque BBQ joint seems to be working, though next time I'd like to sample more of the heartier fare. Cocktails, meanwhile, were promising, and service was on point, too, so I can't complain. Welcome back Jason. Though the clam cakes, poutine and lobster rolls were solid I was bummed that I left LF a little underwhelmed.